Yes, you read that right – here at Great Grass we have a brand spanking new product that has been added to our artificial grass range. 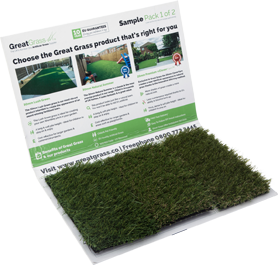 The 36mm Touch of Luxury is the most luxurious Great Grass product we have and is completely exclusive to us. It utilises our Clever Yarn feature which is innovative stitch technology that is designed to achieve ultimate softness unrivalled anywhere else! What makes this artificial grass so super luxurious is that it’s created with our silky soft fibres that are enriched with a deep thatch. It gives the amazing effect of feeling like you’re walking on a cloud! Not only does our 36mm Touch of Luxury feel absolutely lush, it still maintains a realistic look. A lot of other artificial grass products we’ve seen on other sites have had to compromise on either the feel underfoot or the look of the artificial grass; usually the better it feels the fake it looks but not with our Touch of Luxury. Do you crave some opulence, some decadence and some lavish artificial grass for your home? Then our 36mm Touch of Luxury is the perfect choice for you. Contact us today to get your Touch of Luxury artificial grass!